This Sapphire NC home for sale, located at 124 Maidenhaire Lane, is a stunning property. This gentleman’s ranch boasts 14.74 acres and a spectacular 4 bedroom, 4 bath home. The property backs to National Forest and is a perfect spot for any equestrian.Fenced paddocks, a two stall barn, and a separate 2 story workshop with equipment room, tack room, and washing station ensures that horses are well kept and cared for. Furthermore, the trails accessible from the property are fantastic! 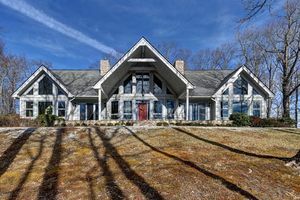 This Sapphire NC property is a stunner! The main house is striking, embracing the setting with windows galore! One of the bedrooms is fully handicap accessible including the ensuite bathroom and closet. There are two garages with huge bonus rooms overhead. One garage is an oversized 2 car garage, complete with a golf cart garage. An added bonus in this garage is the raised dog washing station. The other garage is a separate boat garage. There is also an RV hook-up on site. If you have been looking for the ideal mountain getaway look no further. This home has space, access to the national forest, and its own pond! 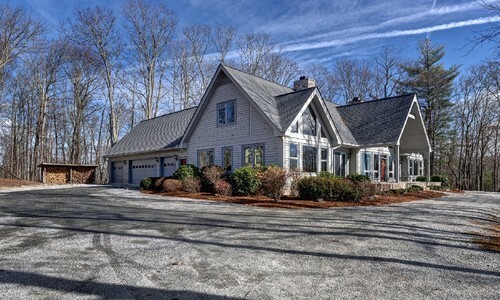 Take the time to visit this lovely Sapphire NC horse property and you will not be disappointed. Contact our team at Berkshire Hathaway HomeServices Meadows Mountain Realty today to schedule a showing of 124 Maidenhaire Lane. We welcome the opportunity to help you conduct a successful Sapphire NC property search. Let our knowledge and experience serve as your guide, helping you locate the Sapphire NC home for sale that suits your lifestyle.